Note: If you’re looking for the best days or times of the week to apply for jobs, you can read it in this article. The article below is about which times of year and specific months are best. What is the Best Time to Look for Jobs? 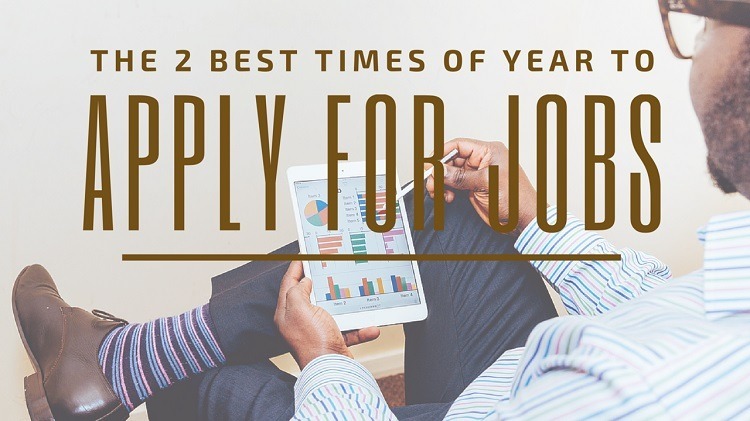 There are certain times in the year that are far better than others to apply for jobs. 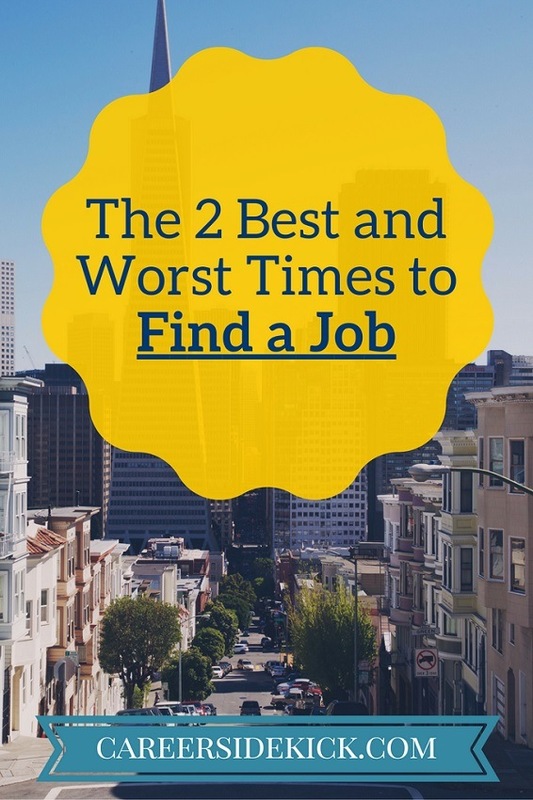 After finishing this article you will know the best times to apply for jobs, as well as the worst times of the year to apply. We’re going to go month-by-month so you’ll instantly know whether you’re in a good or bad month. The beginning of the year (January and February) is a great time for getting hired in most industries. In fact it’s probably the best time to look for jobs all year in most industries. January usually starts slowly as people come back from holiday vacations but by the second week of the month, things are running smoothly. Once that happens, hiring pick up pretty fast and lots of phone interviews and first round interviews start happening. This is the time of year when the greatest number of decision-makers are in the office together, so you can get a “Yes” much faster and start that new job you want! Just make sure you follow-up after your interview because hiring managers tend to be pretty busy this time of year… not just with hiring but with other tasks too. So if you haven’t heard feedback for a week after your interview, check in via email and ask again. Another reason these two months are so good: Companies usually get their new hiring budgets for the year in January, and a lot of the hiring activity that was delayed in November and December can now move forward. So they’ll have a backlog of jobs that need to be filled, and you can come in and fill it! Many companies also pay annual bonuses in December, so a lot of people wait until January to change jobs. Companies expect this so they look to make lots of new hires in January. One more reason it’s a great time of year to search for jobs. These months are still very good times to apply for jobs, for a few reasons. The surge in hiring in Jan and Feb usually keeps some momentum until summer arrives (more on that in the next section). So March, April and May are still great times to try to line up a ton of interviews and land a new job. However, it also means there’s more competition. More people are applying for jobs, and receiving interviews this time of year. So make sure you practice job interview questions and answers so you don’t waste the opportunity. Here’s why this time of year is good in general: As you get closer to summers, companies feel more pressure to finish the interview process and hire somebody. This is because they know people in the company will go on vacation in the summer and it’ll be harder to finish up the hiring process. Example: You start the interview process in early May. After a couple of rounds of interviews, it’s near the end of May, and two key members of the team are going on vacation next month. They’re likely to rush to finish the process with you before they leave. Normally they might drag their feet and put it lower on their list of priorities (if you’ve interviewed enough you’ll know that sometimes companies take FOREVER to finalize things). The summer months are usually slower, and typically aren’t one of the best times to apply for jobs. Managers take more vacations during the summer and it’s harder to get a team together to conduct a face-to-face interview or make hiring decisions. If you’re job searching in the summer and can’t find a job, this could be why. Companies also fill many of their open positions during the hiring push at the beginning of the year (In January-May), so there’s less of a need by the time the summer months come around. That doesn’t mean there aren’t any jobs to be had; you just have to search a little bit harder. You might be able to stand out due to the fact that there are less applicants during the summer months. Because of this, it’s still worthwhile to do some job hunting in the summertime. You just need a bit more patience to put up with people being on vacation and other delays. Don’t expect to finish the interview process and get hired in one week. September and October are one of the best times to apply for jobs (along with January and February mentioned earlier). Why? Hiring happens in waves. Summer was slow, so the early Fall speeds up. Especially as hiring managers return from vacation. More interviews happen and there’s less downtime and waiting. The hiring process is smoother overall and you can get from start to finish faster. Is this better than January and February? In most industries it’s a bit of a toss-up. I’d say it’s almost as good. If January and February are the best time of year to apply for jobs, this is the second best for sure! September and October are great times to job hunt. Take advantage. As November rolls around, hiring managers and HR departments start to put aside their hiring goals and save things for the beginning of next year. They get new hiring budgets in the new year and less people are on vacation so it’s easier for them to wait. People are lazier in the Winter months in general. I’m sure you’ve felt it… you have a few weeks before the holidays and you decide a few tasks can wait for the new year. Unfortunately your job application might be one of those tasks that somebody decides to put off until the new year. Also, late November and December are popular times for vacations so the hiring manager might not be in the office. Even though I just gave you a few reasons why December isn’t a great time to look for jobs, you can still submit job applications so that you’re ahead of the competition when everyone returns to the office in January! At any given time, at least someone from HR will be in the office. Just don’t expect to receive a whole lot of interviews right away, aside from the initial phone call maybe. As long as you don’t mind this, the end of December can be a great time to start your job search. And you’ll probably finish the process and start your new job in February or March. January: Good time to look for jobs, but the first two weeks might be slow as people return from holidays. February: Excellent time to apply for jobs and look for jobs. March, April, May: Very good times of year to be job searching. June, July, August: Not the best times to apply for jobs, but still possible to find a great position. Just be prepared for a slower interview process, as more key staff taking vacations during the summer. September and October: Excellent time of year to look for jobs and apply for jobs. November: Typically relatively good, as companies are trying to make their final hires before the year ends. However, the final one or two weeks of November can slow down a lot due to the upcoming holidays. December: Typically a very slow month where not much will happen in terms of hiring for most companies. If you follow the advice above you’ll be applying at the best times for getting hired. You’ll get more interviews (and the process will move faster) so you can end your job search sooner. While this data can guide you, don’t overthink it! If you just graduated in the spring and need to find a job in the summer, that’s fine. Attack your job search head-on! If you got laid off in November and need to find a job in December or early January, go do it. Don’t let this article discourage you or stop you. The truth is you can get a job in any month, at any time. And you only need one job, right? The data above is just to guide you and provide background info about why certain times of year and considered better for job searching and hiring.